Identification of SHBG sequence variations in a DNA sample from the proband. (a) Schematic representation of the 4.3-kb genomic fragment comprising the human SHBG transcription unit showing the transcription start site (arrow), and the positions of exons in relation to the two overlapping amplicons generated for sequence analysis. (b) The sequence variations in exons 4 and 8 within separate SHBG alleles from the proband are compared with the consensus SHBG sequences on the proband’s other allele. 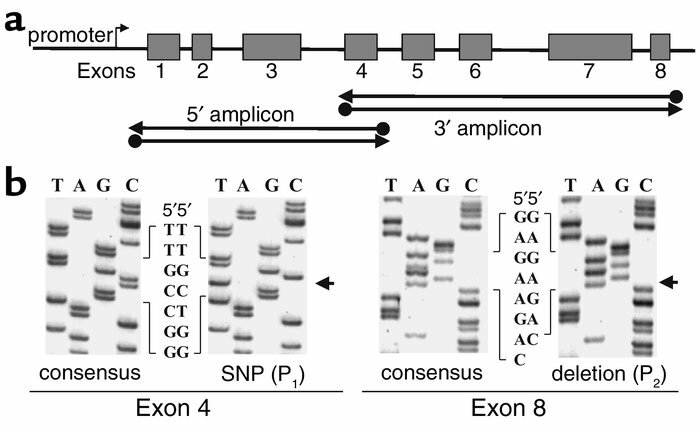 The SNP in exon 4 is designated as P1, while the single-nucleotide deletion in exon 8 is designated as P2. Separate alleles were identified based on the presence or absence of P1 within the exon 4 sequences of the overlapping 5′ and 3′ amplicons shown in a. Arrows indicate the positions of sequence variations.